As a manufacturer or a distributor you want to increase the sales of your product. By working with Chowmain to integrate your product into the Control4 home automation system you get exposure to Control4 dealers in over 50 different countries around the world. We are the market leaders in driver development. With over 10 years of Control4 driver development experience we understand the intricacies of the home automation system and understand what is required to make your product work in the Control4 ecosystem. Having thorough documentation is extremely important. it instills confidence in the dealer, minimizes technical support costs and provides the dealer insight into what they can achieve by integrating your product into Control4. 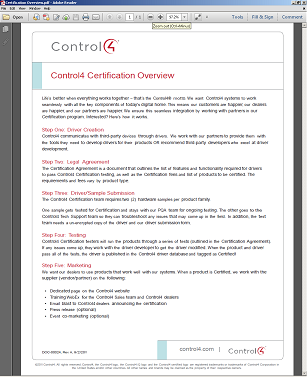 We will hold your hand through the whole Control4 certification process. We have relationships with the right people at Control4 and will make sure that the driver we develop meets the requirements needed for your product to be published on the Control4 driver database. By going through this process your driver will be available for thousands of dealers to download directly from the Composer Pro software and will be marketed by Control4 as a certified product. Control4 has just under 6000 dealers worldwide. Over 1300 of these Control4 dealers showcase our drivers in their showrooms and over 2500 Control4 dealers are on our mailing list. As the Control4 experts and the driver developer we are the best people to support your new driver. We offer various service contracts to suit different sized manufacturers with small, medium or large support requirements. Leave the headaches of support to our inhouse technical support team.